Amir Hall not satisfied despite monumental early success. Setting a conference all-time record is pretty impressive, especially in a league more than a century old like the CIAA. But that’s what Bowie State quarterback Amir Hall did in 2016, his first season as a college quarterback. 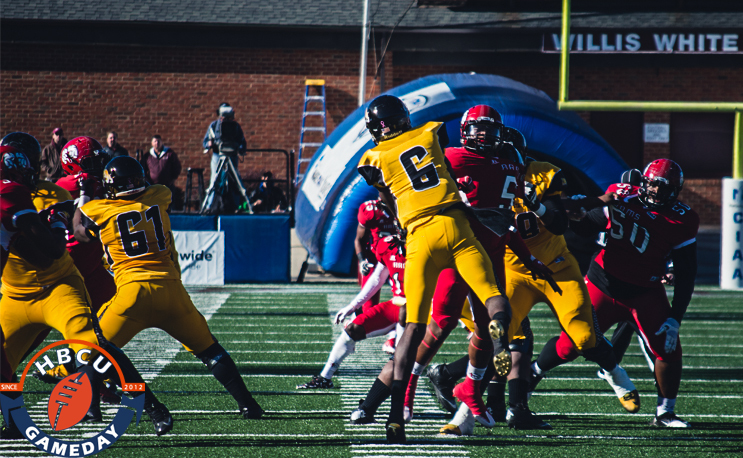 A year ago the 6’4, 180 pound quarterback was fighting for the starting position with incumbent quarterback Nyema Washington, who led BSU to the 2015 CIAA Championship Game. The two were roomates and worked with each other despite competing for the same spot. Washington’s camp injury made Hall the starter by default for the first few weeks of the season, and after he threw five touchdowns in the opener it was clear he had the hot hand. The lightly-recruited quarterback led BSU back to the CIAA title game in 2016, winning CIAA Offensive Player of The Year honors while throwing for 3,596 yards and 30 touchdowns. Add in his nine rushing touchdowns and clearly Hall was a weapon to be reckoned with, which is why he is our top CIAA and D2 quarterback heading into 2017. Despite his heady 2016 season, Hall still feels he and his team have something to prove after falling short in the big game the past two years to Winston-Salem State. He came up with almost 400 yards of total offense and three touchdowns but also turned the ball over four times. Hall and Bowie State will get another shot at WSSU early in the season when the two teams meet at Bowman Gray Stadium, and maybe again in Salem for the CIAA title. That remains to be seen, but what we do know is Hall and BSU’s high-powered offense will have the attention of every defense they face this season.